Guest Post: Review and Giveaway - One and the Same | How Do You Do It? Hello, dear HDYDI readers! We have a special treat for you today. 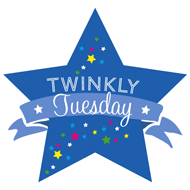 A guest post from the super-awesome twin mom and blogger, Sadia, of Double the Fun. Sadia has given us a very thoughtful review of One and the Same, by Abigail Pogrebin. Even better still, the author is letting us give away a signed copy of the book! Don’t forget to leave a comment that includes a valid email address in the form (email is never made public, never passed out or sold to anyone) so that we can contact you if you win. One entry per person, please. Comments will close this Friday, July 9, at 5PM EDT and a winner will be chosen at random. Abigail Pogrebin’s One and the Same is a book that has challenged me as a mother of twins, causing me to change my parenting in some ways and dig in my heels in others. I hadn’t yet heard of the book when Abby asked me to review it several months ago, but I’m sure I would have bought and devoured it by now even if she hadn’t. Abby is a journalist and an identical twin herself. She set out to write about twinship, and explores the myriad experiences of twinhood in depth. One and the Same balances intimate stories of individual sets of twins with patterns identified by researchers who study twins. Much of the writing is intensely personal, but it speaks to the mystery, joy and challenges of the universal twin experience. I was particularly intrigued by the way that twinship can impact marriage. Abby describes it beautifully. 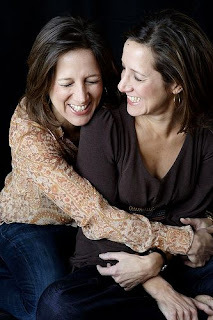 She says that being Robin’s twin has given her, “a congenital clarity of what it is to be wholly close to another human being.” Some of the twins Abby interviewed drew parallels between the twin relationship and marriage. I hope that the compromise skills that my daughters are learning to survive life with one another serve them well should they choose to marry. On the flip-side, Abby points out that during her time at the Twinsburg convention, she notices a high number of twins, mostly male, who have never been married. Might women be put off by the intimacy and affection that twin brothers share? I wept my way through the chapter on twin death. Abby interviewed a man who lost his twin in the Twin Towers on 9/11. She also found a number of people who thought they were singletons and developed an inexplicable fascination with twins, only to discover that they were the sole survivors of twin pregnancies. I look at my daughters and can’t imagine how one could navigate her life without the other. The only part of the book that I didn’t like was, ironically enough, the one that dealt with parenting twins. Whereas Abby spent the rest of the book showing us how different and unique each experience of twinship is, this chapter spoke in generalities, many of which failed to resonate with my experience as a mother of twins. Like Abby, I take exception to the experts’ assertion that every mother of multiples has a favourite child. From time to time, each of my kids drives me nuts, and from time to time, one needs more of my attention. The love, though, is equally infinite. The takeaway of the chapter was that the challenges of raising twins, especially in the early years, outweigh the joys. I disagree. Yes, it’s often hard, but good parenting is hard, no matter how many kids you have. One and the Same is the most astute book I’ve come across that discusses the twin experience. I would have enjoyed it equally, although differently, if I’d never met a twin in my life. Abigail Pogrebin was kind enough to answer a few questions that occurred to me while I was reading One and the Same. This is what she had to say. Sadia: You share intimate and sometimes heart-breaking details about how you feel about your changing relationship with Robin. Has she read your book? What was her reaction? What about your parents’? Abby: I didn’t feel I could write this book without Robin’s blessing (and her editing – she’s a formidable journalist) and so I showed her a draft as soon as I finished it. I admit that it wasn’t an easy read for her at times, and she even challenged me in some places, which I think made me revisit certain sections and rethink them. But the truth is that Robin was incredibly supportive of the book, both privately and publicly. I was grateful that she agreed to go on the Today Show with me and that she worked so hard to prepare for a special event we did together last fall in New York in which she interviewed me about the book before an audience of 200-plus; she made it a wonderful evening. Most importantly, this book made us closer in ways I can’t quite explain. It’s like the truth finally was on the table and we could get on with this phase of our relationship. As for my parents, they were also tremendous boosters, but feel somewhat baffled by why twinship can end up being complicated when it felt so simple to them during our childhoods. Sadia: You’ve described twin romance beautifully, and have been able to convey how normal and natural that intense relationship is, even if much of society is unable to comprehend it and sometimes views it as pathological. My husband and I see that romance growing in our own daughters. Do you have any advice to parents like us on how to prepare our kids for resistance they may get from others regarding their twin relationship? Abby: My only advice is to talk about it ahead of time, to discuss the fact that their twin romance can be intimidating, excluding, or off-putting to other people and sometimes they may want to keep their intimacy to themselves, if that makes sense. Sadia: Many parents of young multiples are careful not to refer to their children as “the twins” or “the boys”, because they want to help the world see their children as individuals, and not just members of a set. If your children had been twins, would you object to them being referred to as “the twins”? Abby: Yes, if I had twins, I would object to people calling them “the twins,” because I do think it has a cumulative negative effect over time; it underlines their two-ness as opposed to their singularity. It may seem unimportant, especially when the twins are young, but I know I hated the term growing up. It felt lazy to me when someone called us that; is it really so taxing for them to say our names when they’re talking about us? Sadia: If you could give parents three pieces of advice on nurturing both their twin’s closeness and their independence, what would they be? Spend separate time with your twins. Even if they resist doing things apart. Encourage different activities, lessons, playdates, pursuits. Let their insularity be. It has its own magic, and at the end of the day, the intimacy wins. Sadia: We have a set of triplets in our extended family. I can’t help wondering how having more than one same-age sibling would affect relationships between multiples. Do you know any higher order multiples? How would you compare their relationships to those of the twins you interviewed? Abby: I don’t know any triplets myself, but I did interview one in my book and her story is worth reading – it appears in the chapter on competition. It amazed me that a triplet can feel like the third wheel when the other two triplets are twins. Abby: As twins, you’re often “noticed” because you stand out – especially if you’re identical. It’s an oddity, a novelty, people notice you, look at you longer, compare you. People are curious, they confer all sorts of ideas about what your bond and relationship must be like. But most of the time, they don’t really get to know you; even the people who see you regularly –relatives, friends, teachers. They don’t necessarily make the effort to get to know who you really separately (and yes, it may take more effort to ascertain those differences.) They seem content with the superficiality of your twinship. So they notice you, yes, but they don’t know you. * Disclaimer – Although Ms Pogrebin did contact Sadia to ask her to review the book, Sadia purchased her own copy. This review was not influenced in any way by the author. I would love to win a copy of this book, I have been waiting for it to hit our local book store. Great interview! I would love to read this! I had seen the cover before but had not read what it was about. Great review! I have been waiting to read this, but our local library doesn’t have it! I have to comment on the idea that a mom of multiples has a favorite. I do not. I have felt more tender toward one or the other of my boys at times, as I’ve felt more tenderness toward any one of my four children at different moments. I haven’t noticed more love, or more intense feelings of attachment, for one twin compared with the other, or to any one child compared to the other three. Can’t wait to read this book. It looks fantastic. Fabulous review, and thanks for the added bonus of the interview! As a new mother of twins, and the daughter of a twin, I would love having a copy! This review is one I’m keeping– not just because it’s generous to my book but because it’s so clear and specific about what Sadia liked and didn’t. I appreciate the candor and above all, that Sadia gave it such a thorough read. It’s not just the sign of a thoughtful writer but a proactive mother of twins, navigating complex-but-thrilling territory. Thank you. Like everyone else, I’ve been wanting to read this book for a while. Parenting twins is definitely a challenge, and I always wonder what I’m doing right. I dated an ID twin in high school who HATED being a twin and his brother, so I try and avoid grouping them as much as possible. But yesterday my one daughter was crying because when she looked in the mirror she saw where she was different than her sister and wanted to be the same. While I thought it was great that she can pick up on the subtle differences and knows that she’s unique, I didn’t know how to soothe her when she needed to be the same. Great review. Although my daughters are fraternal twins, I would like to read this book because my brothers are identical twins who are very close, perhaps too much so. I am the third child and the third wheel. They are newly married to women who don’t really get along, and I do sense some tension among the relationships. It does not surprise me that many adult male twins are unmarried. My brothers joked about “being a package deal” in his toast at his twin’s wedding. Sounds like a great book, and very interesting. I would love to have a copy! Looks like a great book! I have 7.5 month old twins and would love to read more about twins in general since they don’t run in my family. Thanks for the opportunity! Sounds interesting. I’d love to read it! I’ve had this book on hold for weeks from the library – I’d love to have my own copy so I don’t have to wait longer! Having spontaneous identical twin girls and no twins in the family, I’d love some insights and tips on how to better understand and raise our girls. Sounds like a great resource. I have identical girls, now 3 years old, and I have been quoted saying, “it is not their fault that they are twins, look alike,and have the bond they share”. I LOVE watching my girls interact and can’t wait to see how it evolves. I’ve just checked for this book at our public library, and it isn’t there. Our multiples club may have to get a copy. I’d love to read this book. Wonderful, thorough review. I am definitely interested in reading this book! If I don’t win, I will be getting it from the library. I have had this on my to-read list for awhile now! Great review. Friday, the 9th is my birthday so maybe I’ll win! I checked this out from the library when it first came out and I definitely want to own my own copy. Great review! I’ve been hearing about this book lately . . . sounds really interesting. I’ve also wanted to read this book for a while. I would love to win a copy! Pingback: Twin Sister Love - How Do You Do It?